This year for Halloween S was Little Red Riding Hood! Her costume was entirely handmade - the cape and apron from her Gami and the white dress (a.k.a a nightgown) from her Aunt Em. Gami also provided the cute basket to fill up with candy! J was a Firefighter, then a Pirate. He only lasted about 2 houses as a Firefighter before switching. Not sure why he did, but you often never know why 3 year olds do what they do! Plus he was in no mood to pose for a good picture while in costume, so here he is distracted by eating candy! Nathan once again did not disappoint with the Jack-o-lanterns! S celebrated her 8th birthday with again 3 parties - the early party, which was combined with Grandpa's when they visited earlier in the month, the "actual" day/friend party (a fancy tea party theme, complete with a ladies' maid (a.k.a Gami,) and the family party, which was combined with cousin's L and C. She had a great time at all three parties, of course, and one of her favorite parts was getting an American Girl Doll, which she named Julia. 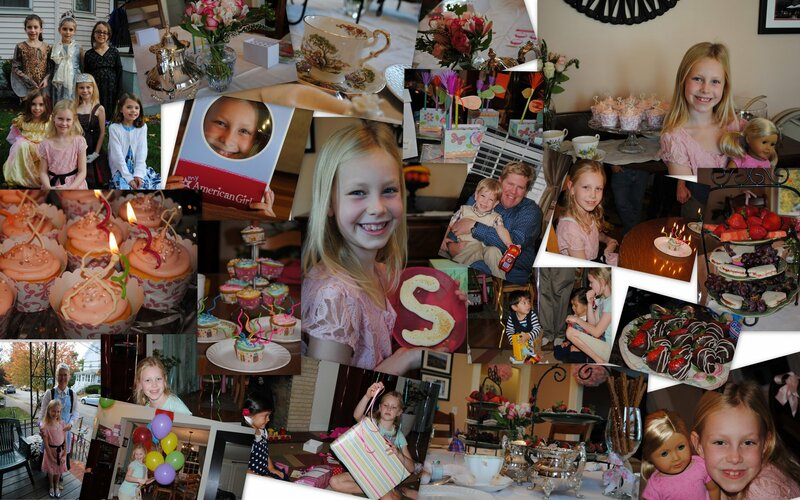 Here's the highlights of the 8th birthday in a photo collage. Click to make it bigger. Sundays are our busiest day of the week since Sydney has her soccer games in the afternoons. After nearly dropping out of soccer after last year (she complained of her shins getting too sweaty....) she decided to give it a go again this year. She got new pink shin guards and matching cleats and that seemed to give her more excitement about playing!! Her team (the Green Mint Chocolate Chips) started the season having their first game without any practices prior due to rain. Needless to say the first game did not end well for the Mint Chips - I think they lost 12 to 0. Subsequent games were not quite as bad, but the team still had a lot of work to do. 3 weeks ago the team had their best game to date with a tie score 2-2. That is until today! Sydney's first great plays happened as Goalie when she protected the goal well from the Blue team and didn't allow any scoring. Sydney guards her goal perfectly! Her next few great plays happened in the second half when she had 2 back to back goals! Score!! Sydney (far right of picture) excited after her first goal. Her team had their first win, 8-4. The team was so excited and you can definitely tell all the practice is finally paying off! Way to go, Sydney and the Mint Chips! !